The pretty fishing town of St Ives in Cornwall is somewhere I’ve grown up holidaying since I was a small child. It holds so many special memories of long, lazy summer vacations spent with family – cousins, aunties, uncles even school friends. And it’s a place that my kids call home even though we actually live hundreds of miles away in London. 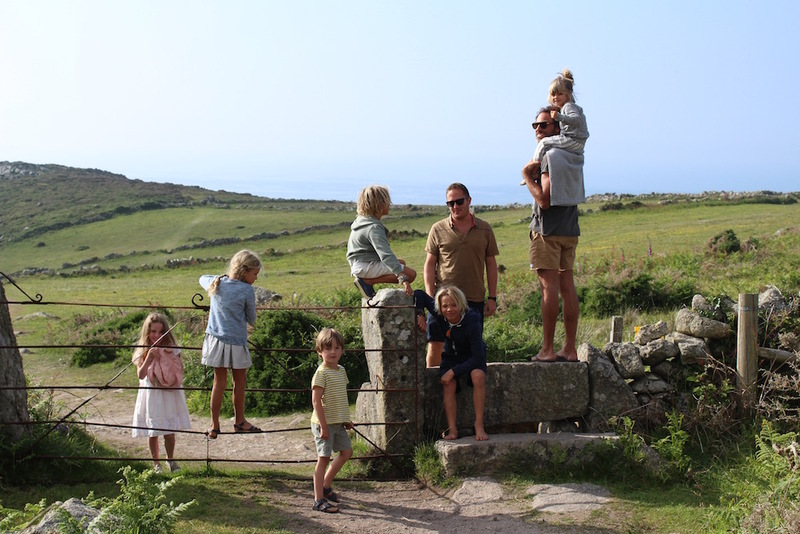 When Courtney and Michael said they’d love to join us on our annual Cornwall trip, we couldn’t wait to show them around one of our favourite parts of the UK. With little time to organize accommodation I was amazed to stumble across the perfect apartment, right on our favourite Porthmeor Beach. With unique decor, dreamy sunset views and enough beds to house our sizeable tribe, it seemed like it was meant for us. Not only that, it would turn out to be one of the driest and sunniest weeks I’ve experienced in Cornwall for a really long time. The only downside to this rare appearance of high pressure hovering over the West was the poor surf conditions that it brought. Despite daily scouring of the surf reports for both the North and South Cornish coasts, we just couldn’t catch a break (excuse the pun) and ‘flat’ was definitely the word of the week. Luckily this didn’t seem to dampen the enthusiasm off our surf –mad, worldly, travel companions. 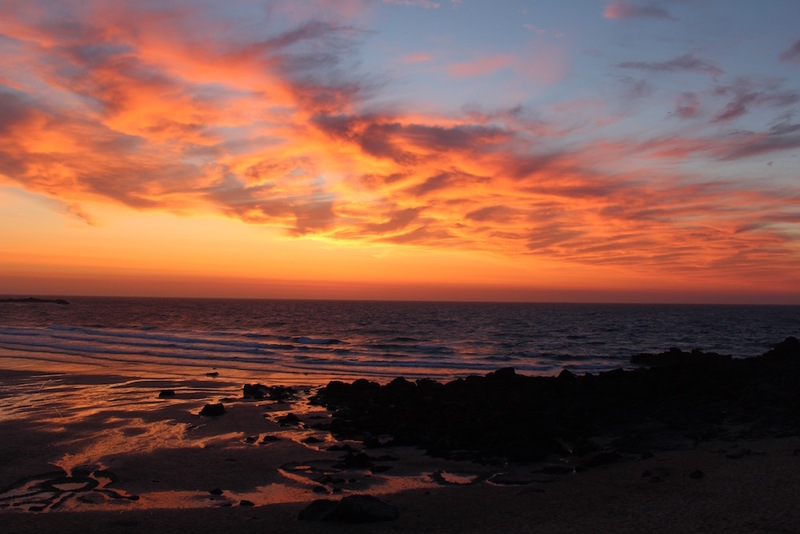 St Ives Bay is a crescent of golden beaches on the north west coast of Cornwall, each with its own charm & beauty. 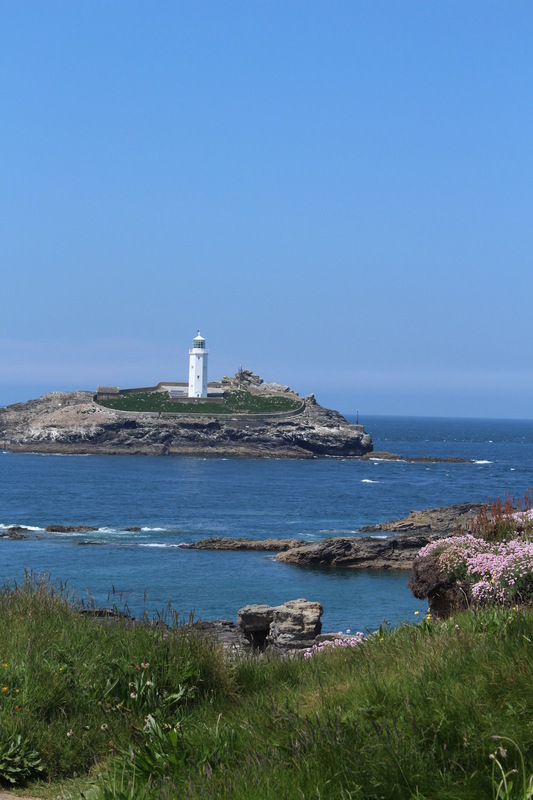 The bay spans 4 miles, from St Ives in the west to Godrevy Head in the east. The town itself is a quaint, bustling hub comprising cobbled streets, pretty fisherman’s cottages, surf shops, art galleries and an abundance of excellent restaurants. The area has long been recognized for its rich artistic heritage, attracting painters, sculptors and artisans who often talk of the ‘special light’ here. Courtney and I enjoyed some rare time to ourselves, spent exploring the backstreets of the old fisherman’s quarter known as the Downalong area. We wandered around the galleries and working artist’s and potter’s studios often stopping to chat to the friendly owners who were keen to strike up conversation. It seems there’s something about coastal living that breeds a laid back warmth and a general willingness to slow down and interact. Or maybe it was the unexpected wall-to-wall sunshine that week, either way we both loved the friendly vibe. 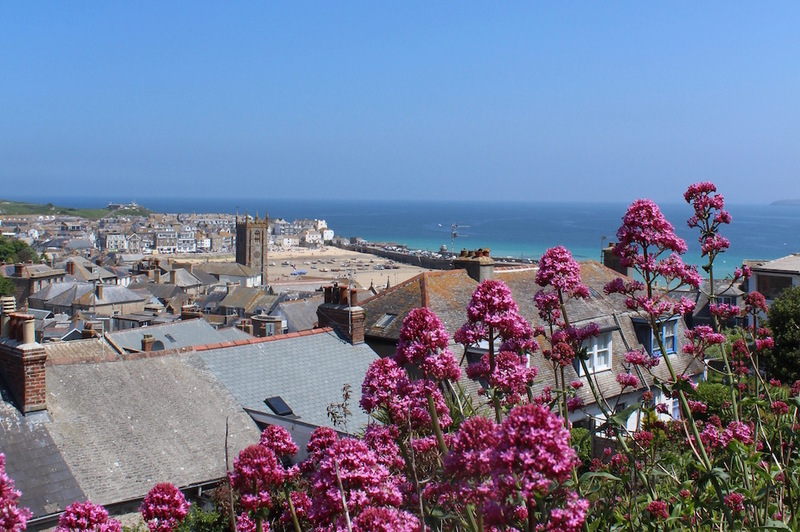 To experience this charming and often overlooked side of St Ives you need to explore further afield than the busy harbour front with its fish and chip shops, ice cream stalls and perilous seagulls! I advise anyone visiting to take some time to peel back the layers of this little town, venture away from the main thoroughfare and get lost amongst the narrow back streets and cobbled courtyards. You’ll discover some hidden gems, such as the lovely Plumbline Gallery on Barnoon Hill selling a beautifully curated selection of homewares, art and handmade jewellery. Then there’s Fish Pye Pottery on Back Road East. Here we got chatting with the owner Laura and watched her at work, painting a recent batch of vases and jugs, ready to be glazed. Her small but perfectly formed studio is packed to the rafters with beautiful ceramics. We couldn’t believe our luck when we stumbled across a shelf of seconds that, though in her eyes were slightly flawed, seemed even lovelier to us. Needless to say we left with a sizeable haul. We spent much of the week being led by the surf forecasts even though most of these turned out to be largely inaccurate. Our mornings began slowly with indulgent breakfasts of Michael’s famous Buttermilk Pancakes, and Joel’s almond milk soaked, overnight oats with fresh fruit. It was often late morning before we ventured out (a hazard of staying in such a comfortable and pretty apartment) by which time the beaches were filling up fast. 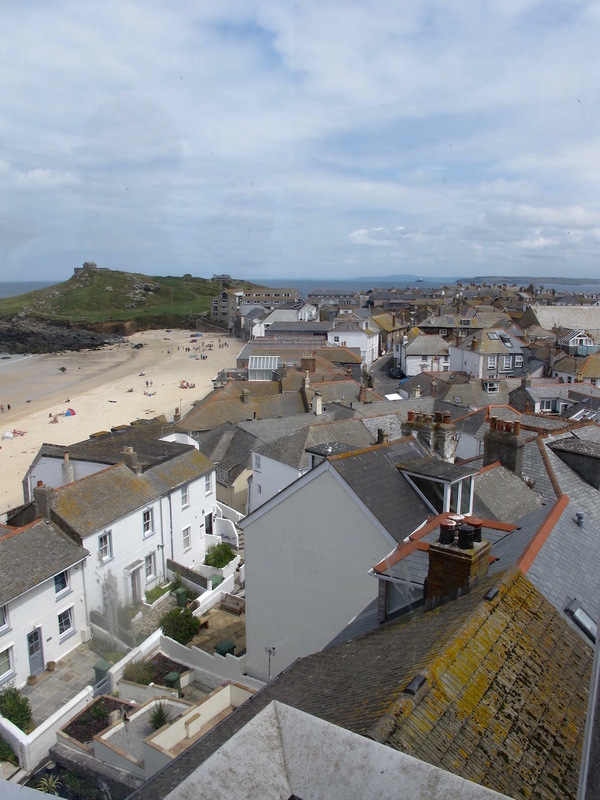 A word of warning – St Ives can get very busy during the school holidays and trying to park close to the town and beaches can be a frustrating process. Many people choose to leave their cars at the park and ride, located a 10 minute walk above the town. 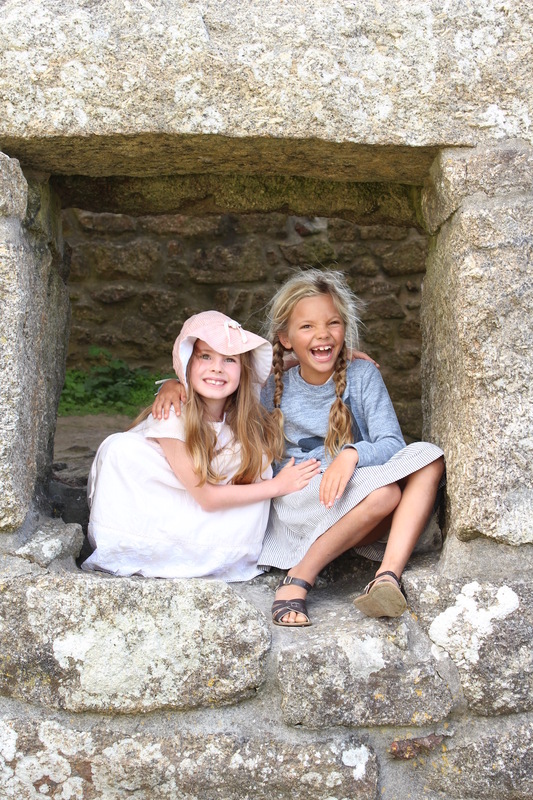 What I think makes St Ives such a great base is it’s location in the middle of a magnificent stretch of the North Cornish coastline, surrounded by stunning scenery on either side. 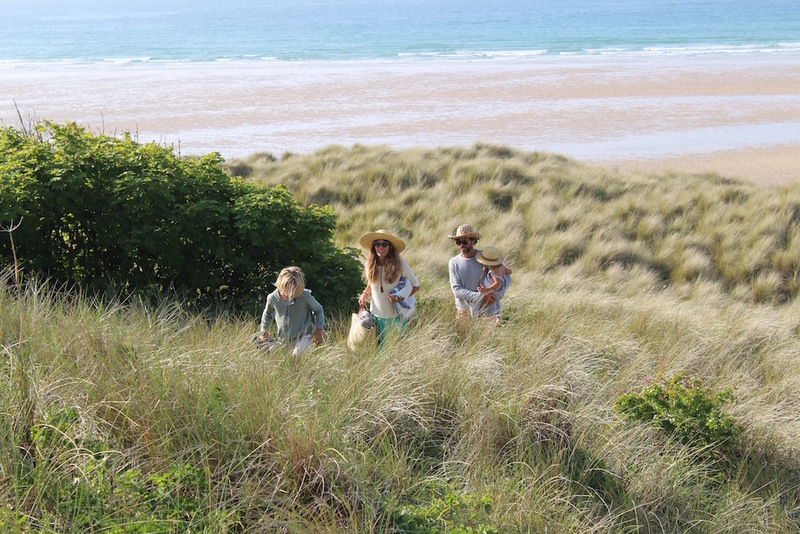 To the east are the beautiful, vast sand dunes of Porth Kidney- our favourite place and the site of many family barbecues. Be prepared for a bit of a walk through the dunes to get there, though the walk itself is a treat. 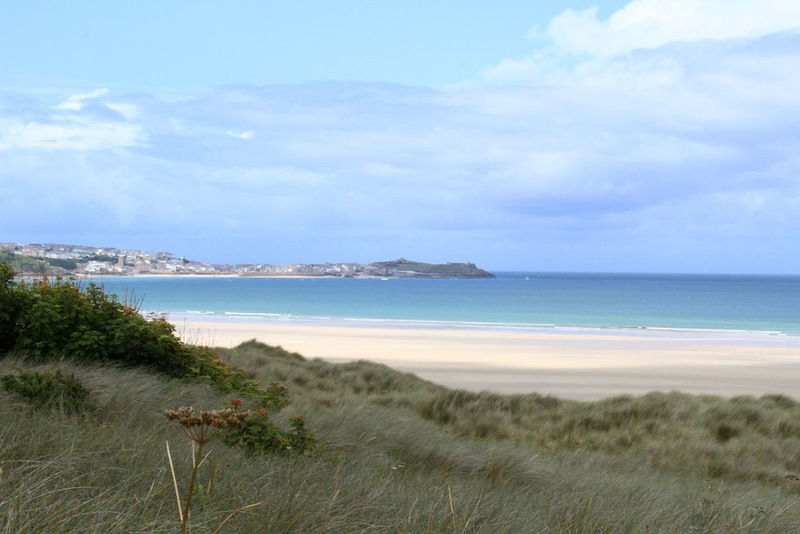 Further round the bay are the expansive Hayle sands and The Towans including Gwithian. 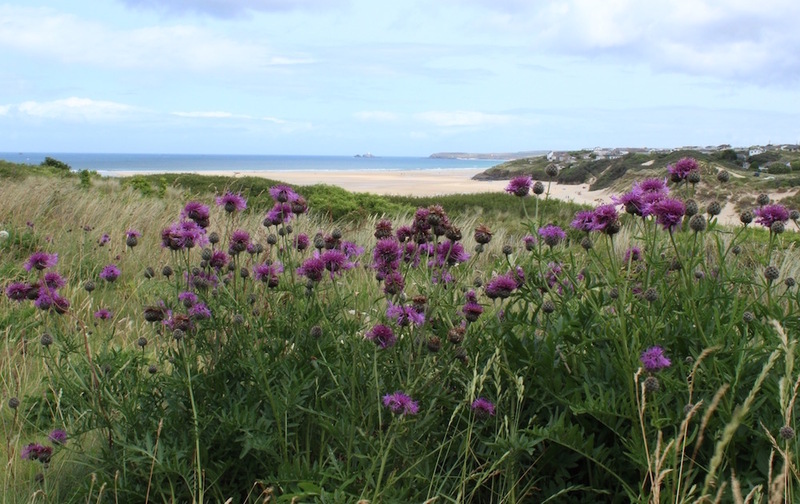 Gwithian is a popular area for surfers and is home to a number of pretty beach houses nestled in amongst the dunes. 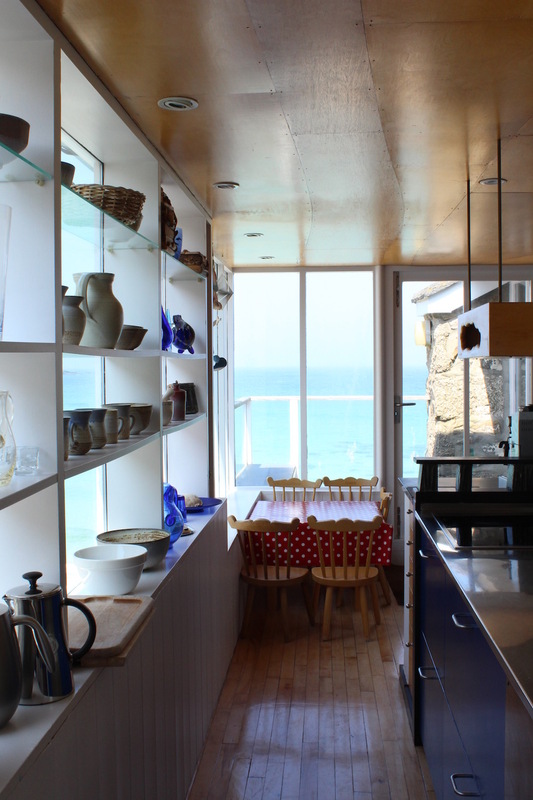 If the hustle and bustle of St Ives doesn’t appeal, these holiday rentals are a good alternative (though they tend to get snapped up quickly by surf enthusiasts). Head out west from St Ives and you will encounter in my opinion one of the best scenic drives in Cornwall. 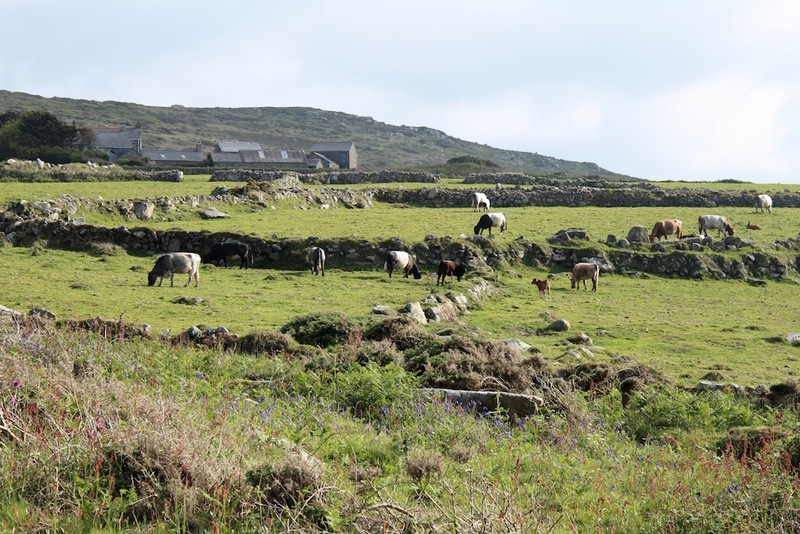 The St Ives to Zennor road is well known for its atmospheric vistas across barren moors, and farmland, peppered by old disused tin mines, iron-age stone walls and rugged rocky outcrops. 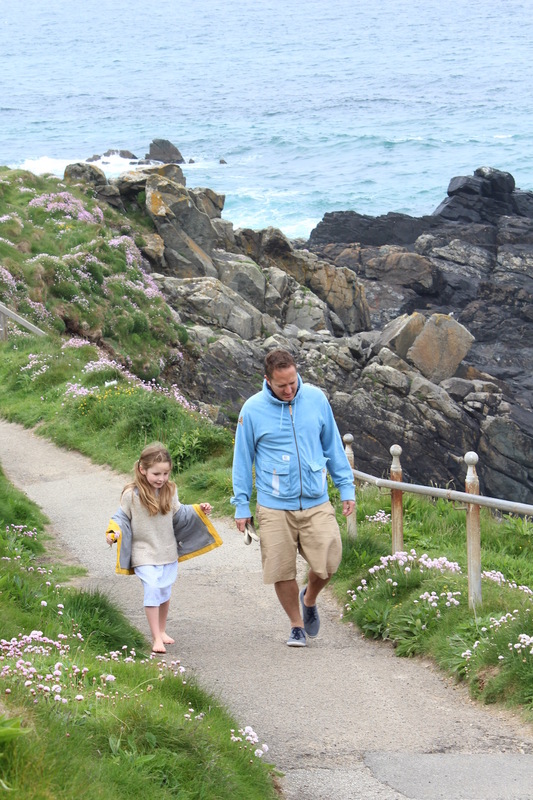 You can walk the coastal path from St Ives to Zennor though at 6.5 miles each way we have yet to attempt this with our kids. The majority of our evenings were spent back at the apartment, gathered together in the huge open plan living area. We took turns preparing meals as the sun sank slowly beneath the horizon, bathing the room in a magnificent orange glow. We even braved the chilly evening temperatures one night to barbecue on the beach in true British style. There are a plethora of great restaurants in and around St Ives but being a group of 10 we favoured staying in over going out. We loved our long relaxed evening meals that often turned into late night games around the dinner table. Our kids have never enjoyed so many late nights and us in turn, so many long lie ins! We have so many happy memories (and photos, sorry!!) from this trip, I have a feeling that my children will be recounting stories about it for years to come. Too many highlights to list them all but below are a few of our top recommendations. 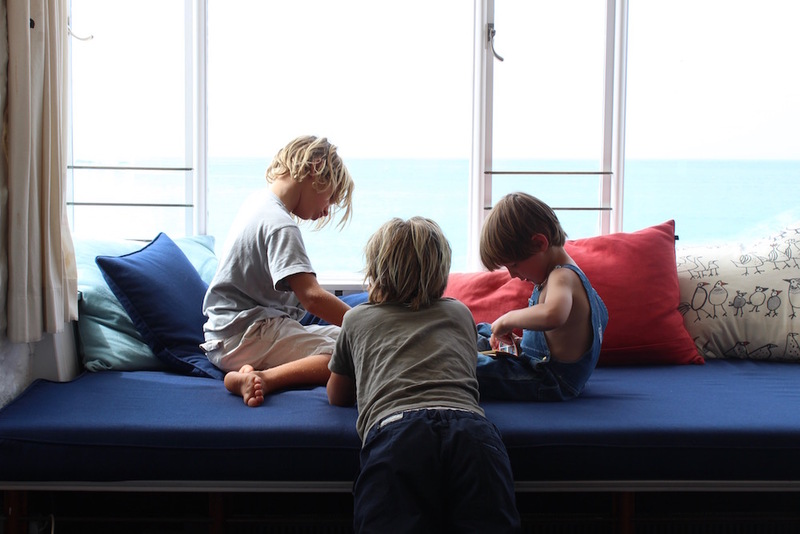 We stayed in the beautiful Upper Saltings on Porthmeor Road. The location, views, layout and attention to detail were hard to beat. 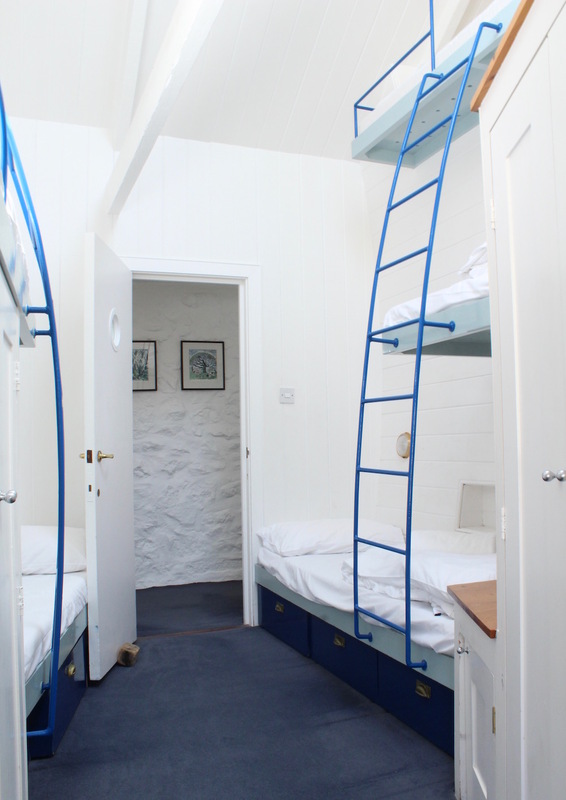 Our kids loved the six bed bunk room, so much so we found it hard to get them out in the morning. Walk the 20 minute coast path around ‘The Island’. The path starts just above Porthmeor Beach and takes you around the area known as The Island, past the coastguard station and finishing at the hilltop chapel above the pretty Porthgwidden beach. Tate St Ives On Porthmeor beach. Be sure to venture up to the café which has wonderful views across the rooftops. Note that the Tate is currently closed for refurbishment until Spring 2017. Barbara Hepworth Museum and Sculpture Garden On Barnoon Hill. Here you will find her studios and the largest collection of her works displayed throughout her beautiful, subtropical garden. A tranquil oasis and a must for any art lovers. You can buy a joint ticket for the Tate and the Hepworth Museum at a reduced price. 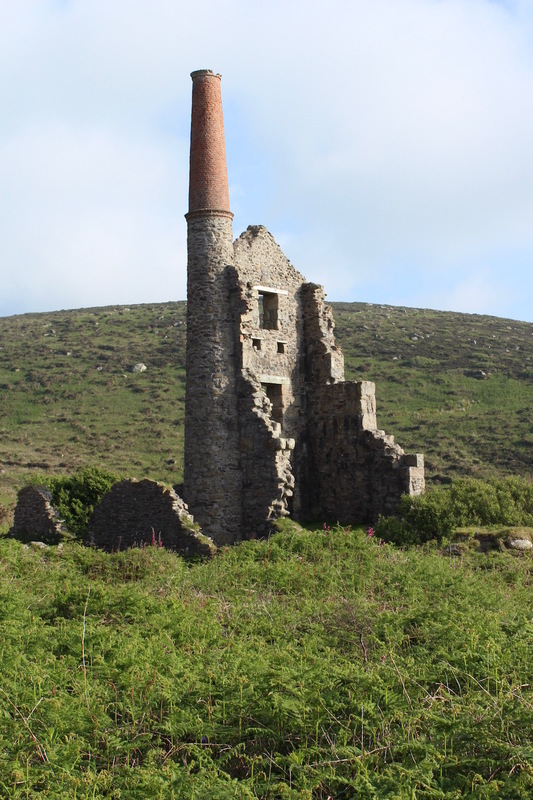 Drive the St Ives to Zennor road and park up at the imposing Carn Galver Mine. Here follow the footpath down towards the sea. You’ll clamber over rocky steps, across rolling fields that slope gently down to the cliff face, over stiles and past a beautiful ruin of an old farmhouse. 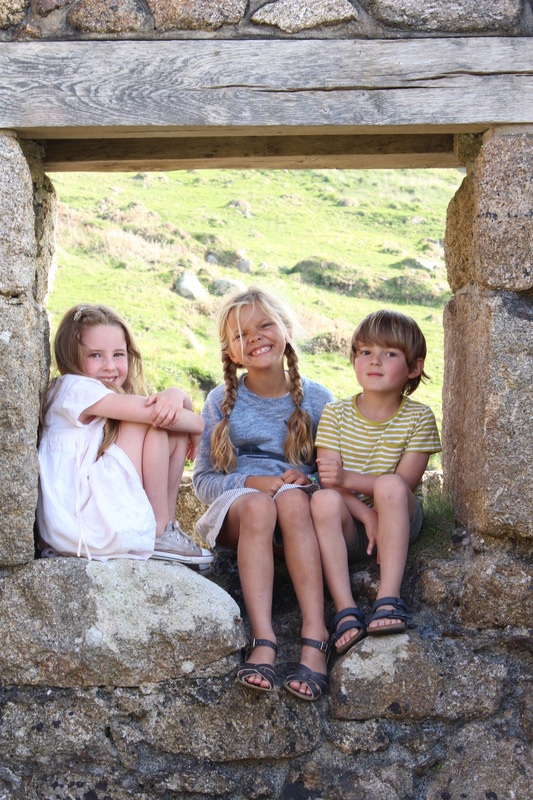 This is one of our favourite places and the gentle 30 minute walk is perfect for younger children. 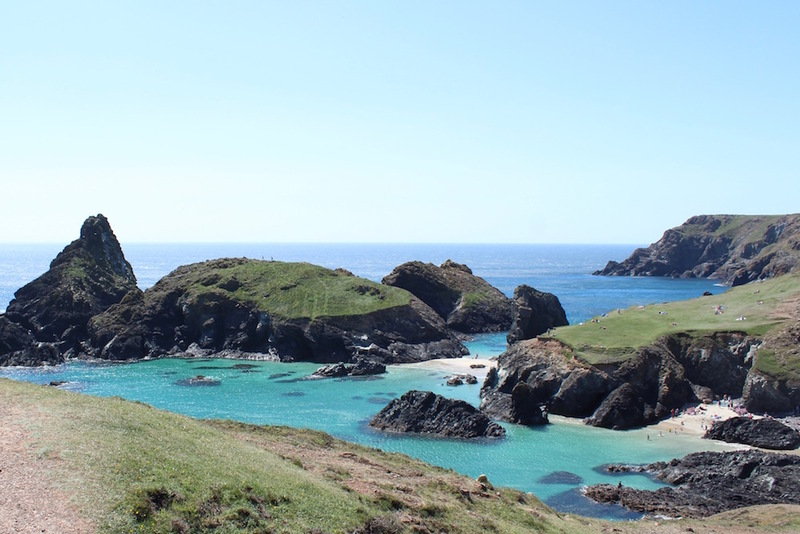 Kynance Cove. 1 hours drive, on the South Coast. It’s towering cliff stacks and bright turquoise waters produce spectacular views. The path down from the car park offers some great vantage points to take in the views of the cove and you might also run in to some friendly free roaming cows. There is also a good café above the beach. 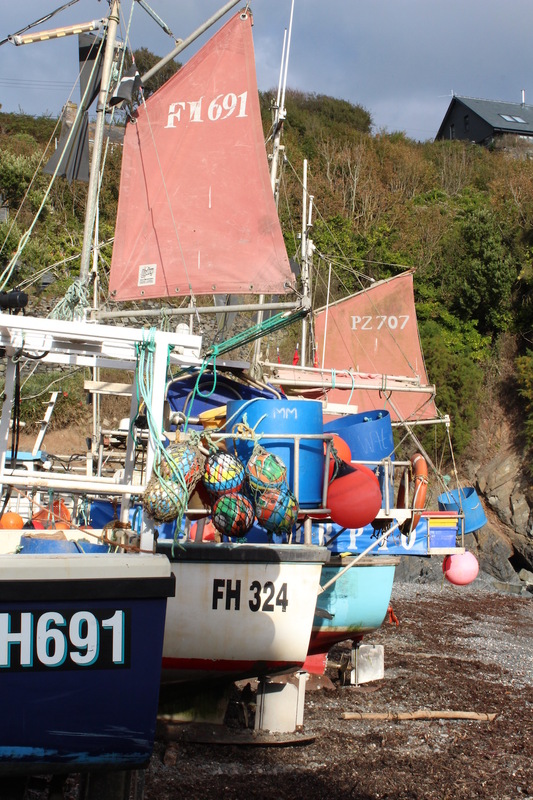 For a taste of untouched cornwall drive 4 miles west across the Lizard to the tiny and picturesque fishing village of Cadgwith. Here crab fishermen still pull their boats down the beach every day. You can buy freshly caught crab from the lovely little fish shop by the beach. St Michael’s Mount One of Cornwall’s most famous landmarks. The Castle dates back to the 14th Century and has a fascinating history. 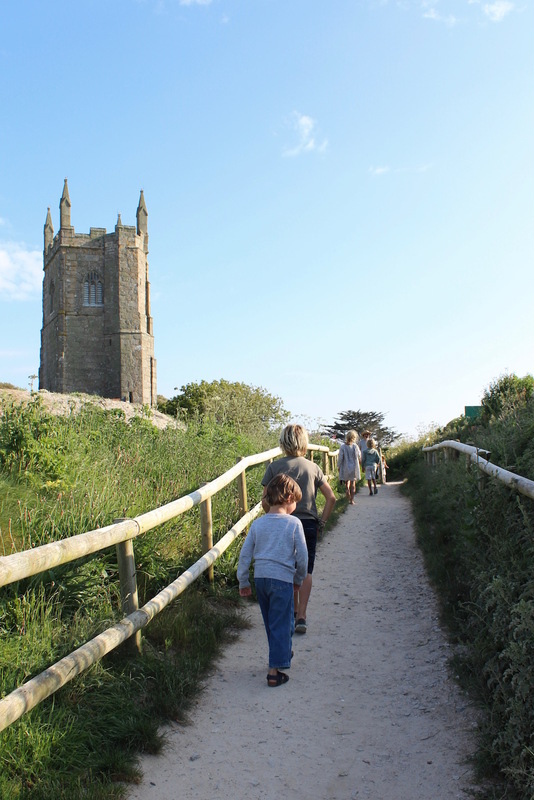 It can be accessed by boat from Marazion or at low tide you can even walk across the medieval stone causeway, just be sure to check the tide times before setting off. The Camel Trail. About an hours drive back up the north coast to Padstow, the Camel Trail is a cycling route that follows an old disused railway line. 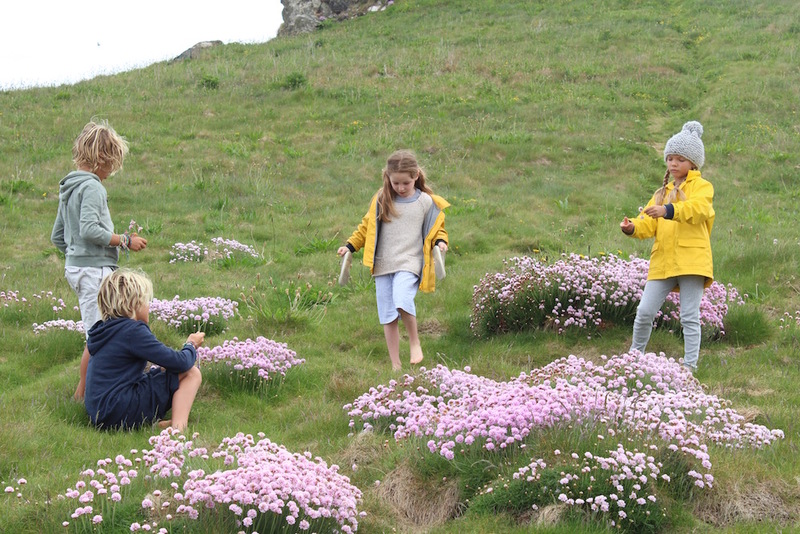 The route runs through woodland, moorland and alongside the scenic Camel Estuary, it is a haven for wildlife and is mainly flat and therefore family friendly. In total the trail covers 18 miles but you can choose to ride shorter sections, Padstow to Wadebridge for example is around 5.5miles. Bike hire including tandems & child trailers is available at various towns along the route. The Common Wanderer on Fore Street. A very cool clothing/lifestyle shop with a focus on outdoor living. I loved everything about this shop especially their unique selection of coffee table books. The St Ives Bookseller This sweet little bookshop on the corner of Fore Street sells some great children’s books including speciality books written by local authors, many of which are set in the town. Fish Pye Pottery Hidden away on Back Road East in the Downalong area. 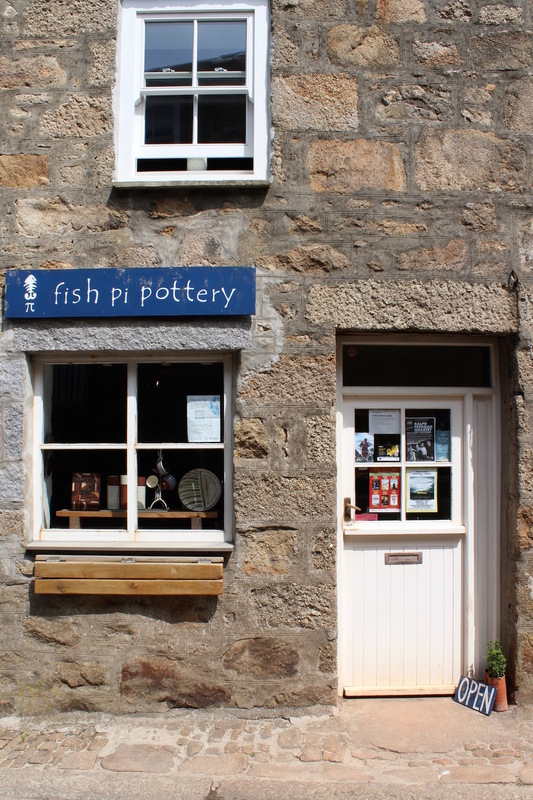 Its one of my favourite ceramic shops in St Ives. Penwith Gallery An impressive gallery space on Back Road West, awash with the famous St Ives light. Here you’ll find some stunning pieces of art, sculpture and ceramics. Norway Stores On Back Road West. A small yet surprisingly well-stocked corner shop, invaluable for anyone staying in the ‘Downalong’ side of town. Great for picnic essentials, good wine, a selection of meats and cheeses, freshly baked scones and nestled right between the bread and pastries, a totally unexpected find. A basket of the sweetest watercolours, hand painted by a local artist on scraps of paper. 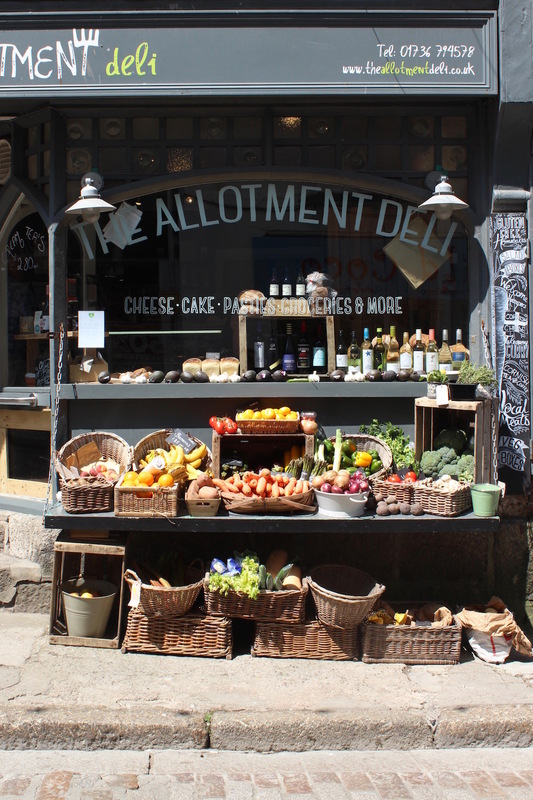 The Allotment Deli, Fore street. Organic grocers with an enticing array of fruit and veg and a good selection of speciality products. 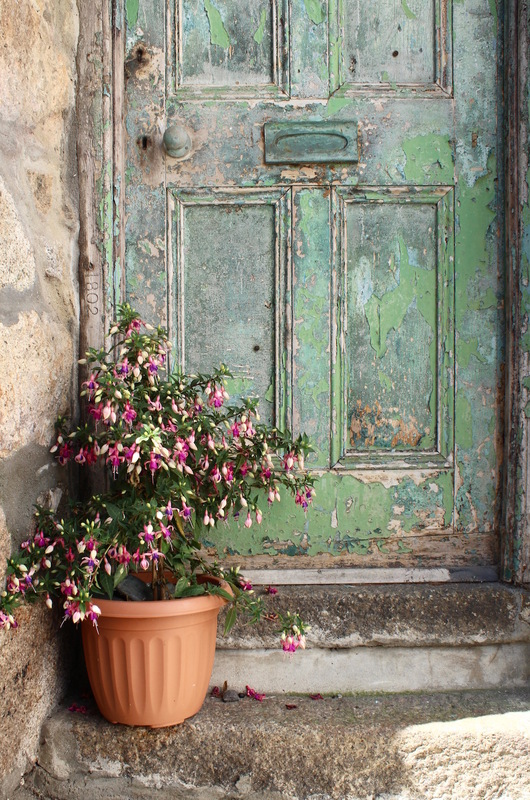 The Digey Food Room On The Digey, one of St Ives’ prettiest streets. A great little deli with good coffee, breakfasts and perfect picnic treats. Sweet Lime Studio New to st Ives on Wills Lane, this colourful and eclectic store sources homewares, clothing and jewellery from all over the world. Plumbline On Barnoon Hill, opposite the Barbara Hepworth museum. We loved their handmade Danish rings and Brickett Davda ceramics. Atlantic Knitwear This charming shop on Fore street is packed with traditional, cozy fisherman’s sweaters and hats. 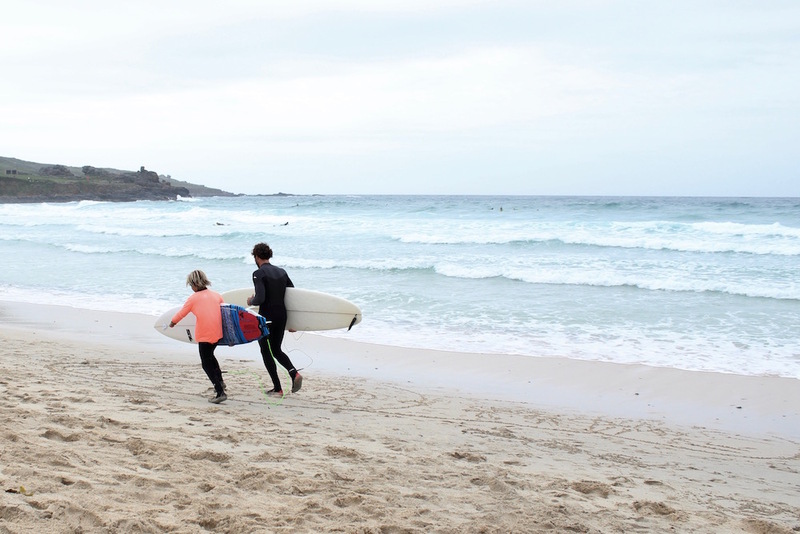 Porthmeor Beach Café Out on the terrace overlooking the surf is our favourite spot for lunch on a sunny day. The ‘creative tapas’ style menu is filled with so many delicious dishes its often hard to choose. I dream all year long about the Crispy Monkfish with chilli caramel and pineapple shavings and the grilled Bananas with salted caramel and clotted cream. So good! Porthminster Beach Café Situated right on Porthminster beach with far reaching views across the bay to St Ives harbour. Their award winning menu has a mix of Mediterranean and Asian influences. With a warm atmosphere and a good kids menu too this is one place we return to time and time again. The Gurnards Head Situated a few miles out of St Ives on the road to Zennor. Delicious food with a focus on seasonal and local produce. They also have rooms to stay. West Beach Bakery. A relatively new addition to St Ives located at the far end of Porthmeor Beach. Great for breakfasts and Sourdough Pizzas. Porthgwidden Beach Café Tucked away beside the pretty little Porthgwidden beach and its colourful beach huts. The simple menu here is always a big hit with our kids and the beautiful soft sandy beach is a hop, skip and a jump away from the terrace. We’ve spent many a summer evening here enjoying a jug of chilled sangria whilst watching the kids play on the beach. The Tinners Arms This is a lovely pub situated in the tiny village of Zennor. They serve locally sourced food and a good selection of Cornish ales. A perfect reward for anyone attempting the demanding St Ives to Zennor costal walk. We’d love to hear if you have any favourites to add, we’ll be back next year to try them out for sure. Thank you. Thank you for sharing Kate!…. And what a pretty part of the world it is even if it rains. It looks so dreamy and you have definitely made my mind up on our holiday destination this year, thank you. Ahh take me with you! I hope you love it as much as we do. England is so full of magic – love seeing it through your eyes Kate! Thanks lovely Annie, you’re so right it is magical! Thanks Rachel. It seems you can’t have both, don’t tell the Adamos but I’d take the blue sky over the surf any day! 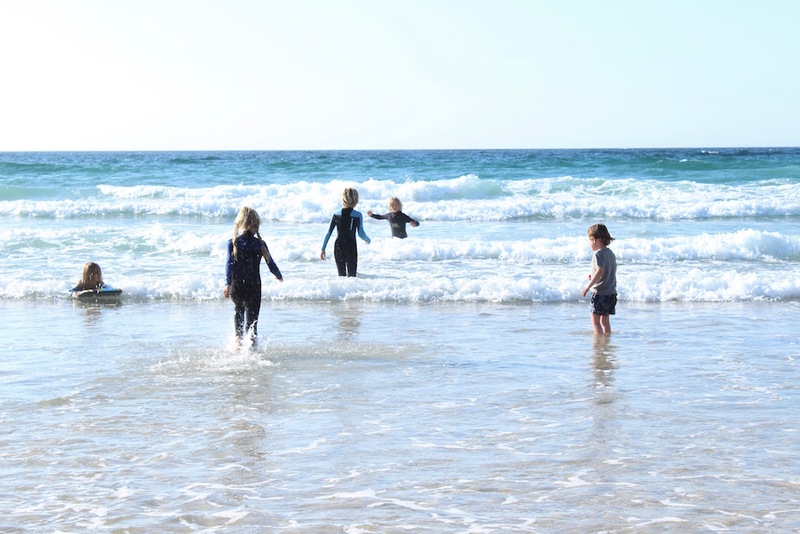 this review is putting st Ives as a top contender for our family trip this winter. What are the best ways to get there from London? Also, have you visited in late winter/early spring? Are the restaurants and shops open? Thank you for the tips! Hi Josette, a lot of the shops and restaurants do shut down during the winter low season but you will find that with a lot of Cornish holiday towns. The upside is deserted beaches and much easier to get around. Have you tried https://www.cornishgems.com for other properties. One more question, we’re going back to England to visit my husbands family. Are there any other vacation rentals you’ve stayed at that would be nice for a group of seven including grandparents and a 1 and 4 year old? Thank you! 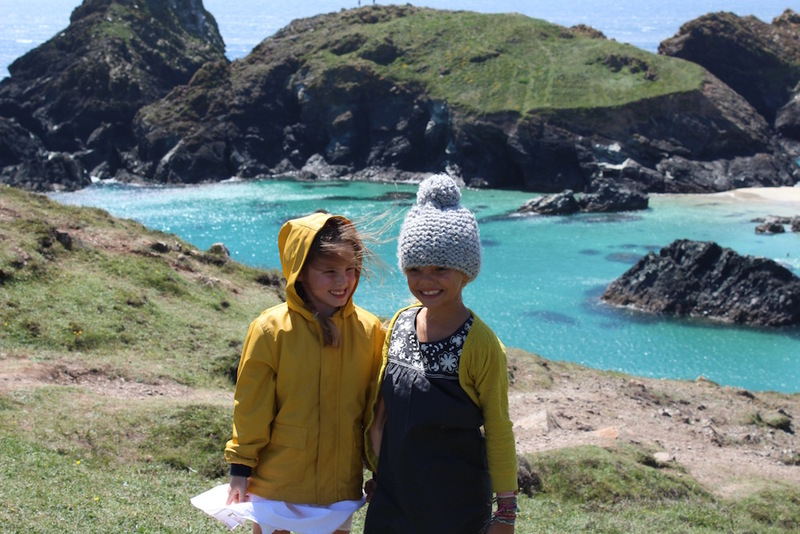 This post really helped us plan our Cornwall holiday….thank you! My husbands sandwich was indeed stolen by a perilous seagull so watch out if you take a picnic like we did. We purchased a book “Treasure from the Sea” by Lisa Woollet and Sarah McCartney and would thoroughly recommend it. It’s about a girl in Cornwall who collects beach treasure as clues to what lies beneath the sea. Beautiful illustrations. My kids are really enjoying it.